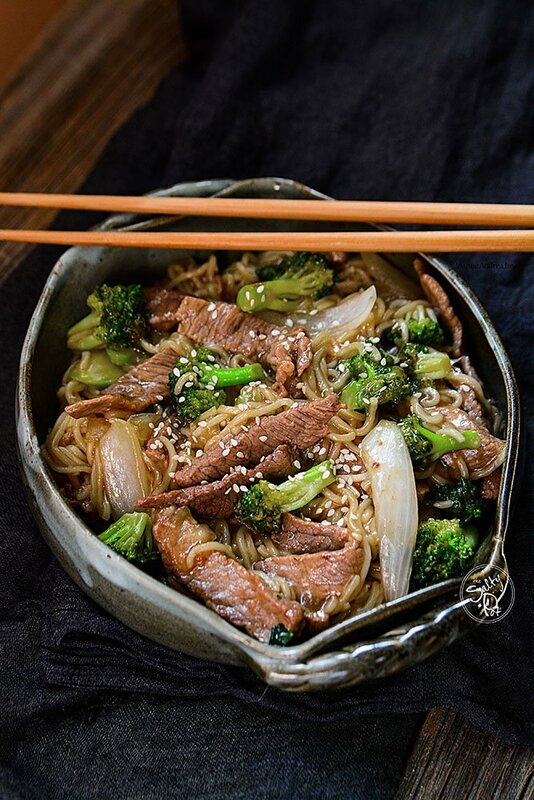 Easy Skillet Beef and Broccoli Ramen hits all the “bliss points” in this amazing recipe. 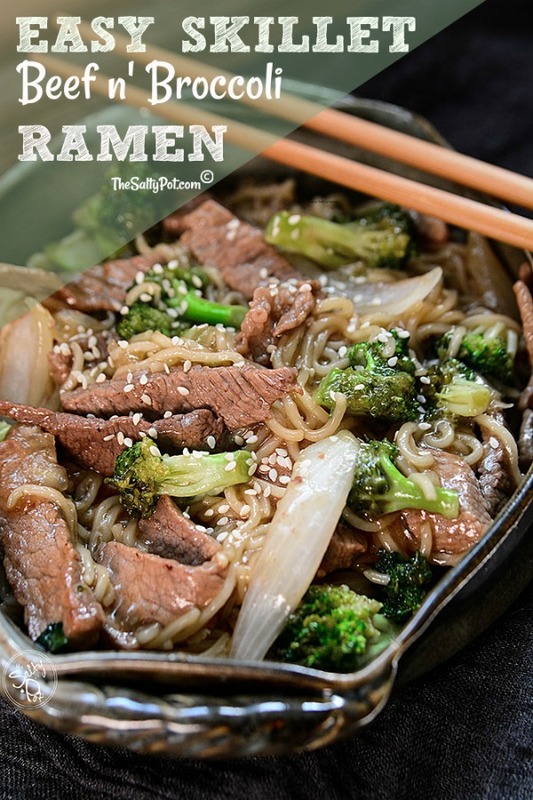 It has the savory tender flavor from the beef, the tender fresh bite from the broccoli, and the comforting noodle softness from the Ramen noodles. Not only is this dish delicious, but let me show you how it solves some culinary problems! And it literally tastes SO FLIPPIN’ GOOD!!! You’ll want to start out with slicing up your beef. Don’t make spend your time making this perfect guys!!!.. Honestly,.. it’s all going to the same place. Take your steak and slice it as thin as you can. If the pieces of meat are too long, simply cut them in half. You can season them at this point with some pepper and garlic powder if you like. It’s not a prerequisite, but it will definitely add more flavor in the final dish. Cut up the broccoli into bite size pieces that you like. If you have the stems of the broccoli, DON’T WASTE THEM! Once you peel the tough outer layer, then inner is nice and tender. Slice them into medallions and add them with the florets. They stretch the grocery dollar! Skillet Beef and Broccoli Ramen is called what it is, obviously, because it’s all done in one dish. With the exception of soaking the noodles, which just take a bowl and some hot water. So that’s next on the list, – just heat up some hot water in a kettle! As soon as it’s boiling hot, add the noodles to the water, cover and let sit until you need them. Slice up your onion and put it beside the broccoli, hand and ready to go. In a bowl, put together all the ingredients for the sauce. Set it aside…….. but keep it handy, you’ll need to use it soon! 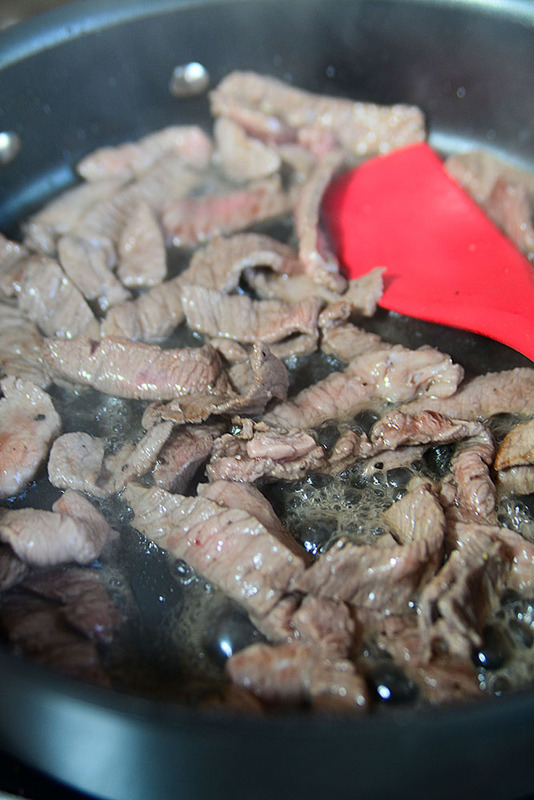 Throw your beef in the pan with a bit of oil to begin the frying process. Add the onion so it begins to soften. What about my alternatives to this Beef an Broccoli Ramen Recipe? Yes.. this is where your switchups happen! Want to add other veggies? Let’s say carrots or snap peas? Now would be the time to do it, because now is the time to add the broccoli!! You want to cook this over a fairly high heat as to evaporate any of the excess water that may come from the broccoli and onions. But what about those ramen noodles???? Ok, so drain those yummies and dump them in the skillet as well. **Pro tip: The ramen noodles are kind of long and if you’re ok with that, by all means, leave them. take some clean kitchen shears or a sharp knife and carefully cut them in sections before you put them in the pan. Remember the sauce from earlier? Grab it and pour it in! Again.. give it a good stir!! 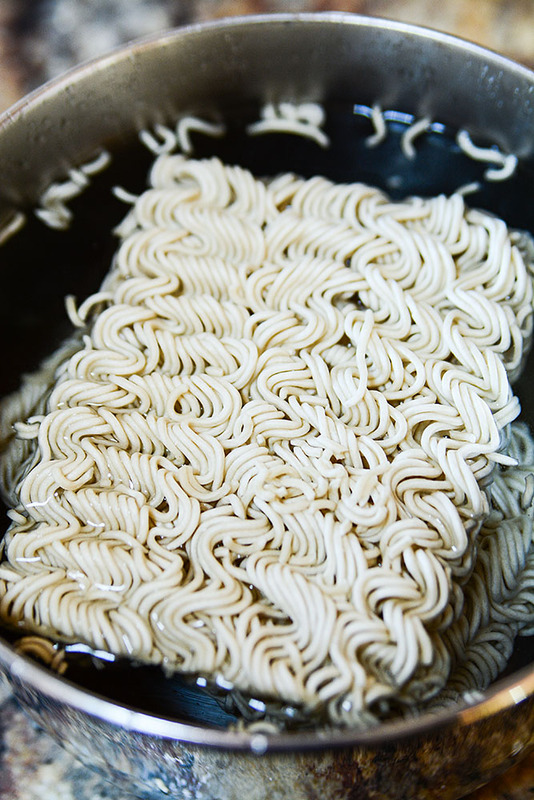 The noodles will soften up a bit more in the cooking process, so be sure to leave those till last because the beef and broccoli part will be perfect, but the ramen noodles may get too mushy. or this Super Easy Breaded and Baked Chicken? All easy dishes,.. so how can you go wrong?? 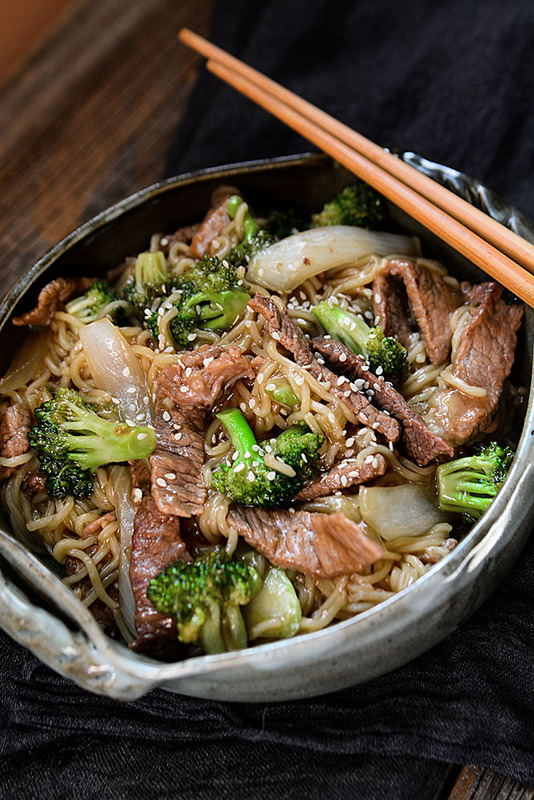 Easy Skillet Beef and Broccoli Ramen hits all the “bliss points” in this amazing recipe. 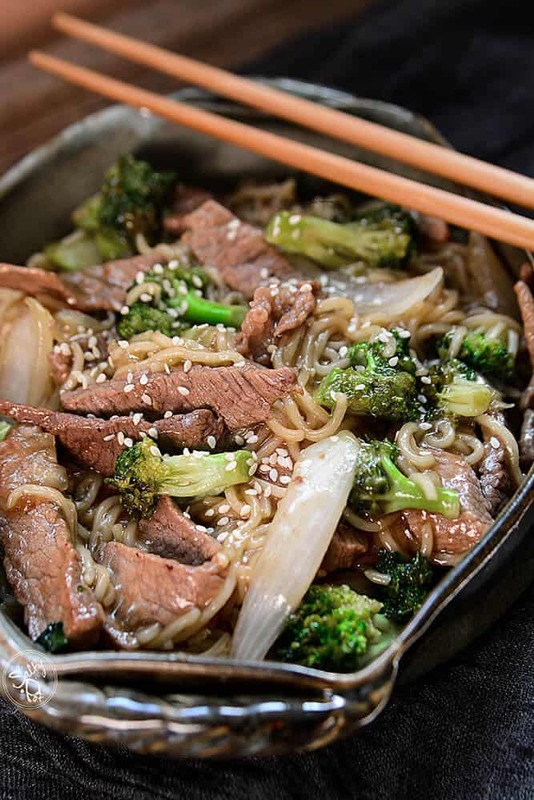 It has the savory tender flavor from the beef, the tender fresh bite from the broccoli, and the comforting noodle softness from the Ramen noodles. It is not only delicious recipe just in it’s own right, but it solves a lot of other culinary problems! Keep reading to find out how! 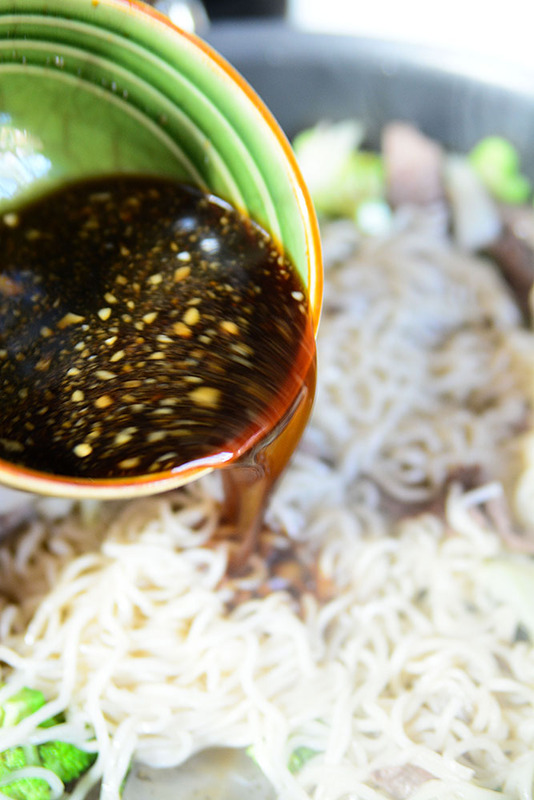 In a small bowl, combine the soy sauce, honey, ginger, garlic, and broth. Mix well and set aside. In a smaller bowl, combine the cornstarch and water. Mix well. Set aside. In a small pot, cook the ramen noodles according to the packet directions, leaving the spice packets out. Using a large fry pan or a wok, begin by putting in the oil and turn the stove to medium high heat. Add the beef. The pan should be sizzling with the beef as you want this to cook quickly. Saute the beef , stirring constantly. When the beef is ½ way cooked, add the onions. Continue to saute at a high heat. 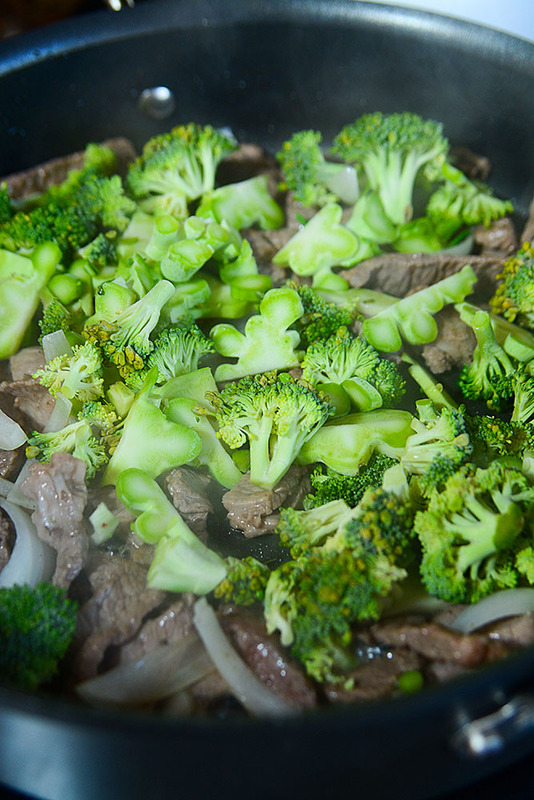 When the beef is just cooked and the onions are beginning to get tender, add the broccoli and saute. When the broccoli is bright green in color, add the ramen noodles. You can cut them in half for easier handling if you wish, or leave them whole. Add the cornstarch mixture, stirring constantly, while the sauce thickens. When the sauce has thickened and is coating the ingredients, the dish is ready to be served. Garnish with sesame seeds and a dash of sesame oil if you wish. « 30 easy and best camping meals ever!